The New One gave the reigning Champion Hurdle hero a lead from flag-fall until after the second-last flight where Buveur D'Air ranged alongside Nigel Twiston-Davies' popular performer. Barry Geraghty asked Nicky Henderson's six-year-old for a bold leap at the last and the 2-11 shot attacked the obstacle before bounding two and a quarter lengths clear. 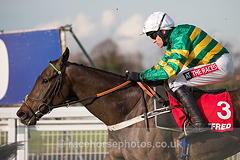 Geraghty told ITV Racing: "The New One is no mug, so I had to go for everything, but he's such a slick hurdler. "He was very professional and relaxed. He jumped nicely, travelled, quickened and won as he had to." Henderson said: "I watched him over the first two and he was quite low, Barry said you wouldn't see anything quicker from A to B. "He said he was too young to remember See You Then but that was also his asset. The great thing is he just flicks the top bar but his knees are up, his feet are in and out and he's gone. "That was great. He needs to run again and he's still not lighter than he was at the start of the year. "The race at Sandown (Contenders) is a possibility but he needs to go somewhere. The good old The New One is probably fed up of seeing Henderson at the moment as Tent (My Tent Or Yours) did him last week at Cheltenham. "We'll talk to JP (McManus) and they'll have a plan afoot. Would he go to Ireland? I don't honestly know. There's the Contenders or the Kingwell (Wincanton)." Asked if connections of Faugheen would be fearful after that success, the trainer replied: "I hope so. I hope they didn't enjoy watching it. "We did, though, because he had to go and do it like that."